In 1831, newspaperman Horace Greeley popularized the saying by John Soule, “Go West, young man.” Many enterprising immigrants took these words literally and made their way to the burgeoning city of San Diego, California. One of the most resourceful of these was a Prussian Jew named Isadore Louis. Born in Lessen, Prussia on July 4, 1836, Louis arrived in the United States on his 21st birthday. He first lived in San Francisco, then Los Angeles, and finally arrived in San Diego in 1870 with his wife and family in tow. He became a naturalized U.S. citizen on Nov. 2, 1874. Upon his arrival, he opened a cobbler shop on Fifth Avenue, and quickly became a “cobbler to the stars” of San Diego, as he made fancy French shoes for all the local rich and famous, both men and women. All this within two years! Additionally, he served as a notary public and managed the Louis Opera House, which specialized in road shows, circuses, and minstrel shows, not operas. Louis built the opera house, located on the east side of Fifth Avenue between B and C streets, in 1887. He later expanded his real estate holdings to include a cigar store and a candy shop. 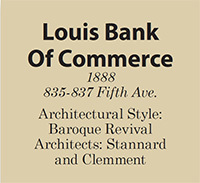 As he quickly went from cobbler to capitalist, in partnership with the Bank of Commerce, Louis built the Louis Bank of Commerce Building during San Diego’s boom years of the 1880s. The bank specialized in business loans, so this proved to be a perfect fit. 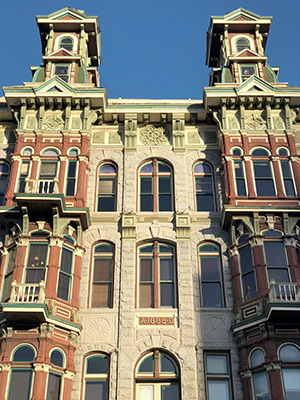 Designed by well-known architects, Stannard and Clemment, this four-story Baroque Revival structure possesses so many noteworthy and elaborate Victorian architectural features that it has been dubbed “The Queen of the Gaslamp.” It is also reputed to be the most photographed building in the Gaslamp. The building itself is composed of brick with a granite facade. Four large, three-sided bay window projections on the second and third levels are elaborately decorated in cast terra cotta and wood. Stone spandrel panels between the second and third floors have a carved radiating motif. As some of the building materials were pre-built on the East Coast, all did not arrive in a timely manner. Consequently, only three of the four planned balconies were built. This gave the building a somewhat unbalanced look, which is actually not usually noted when viewing the structure, as there is so much detail to absorb. The building is capped by twin towers on the mansard roof. Atop the towers are eagles with outstretched wings. The original towers were lost in a fire in 1904 but have been restored as the original molds by a New England foundry were still available. An elaborate skylight in the interior allows natural light through to the second level, which is lavishly appointed with carved wood railings and doors. The Bank of Commerce remained until 1893. On the ground floor, Isadore Louis opened the Maison Doree, featuring an oyster bar and an ice cream parlor. As San Diego did not have an ice plant at the time, ice was brought in from Lake Tahoe. The oyster bar was said to be the favorite hangout of Wyatt Earp, another noteworthy capitalist, and his wife, Josie. The Maison Doree was touted as the finest restaurant in San Diego, so all the wealthy ate there, providing Wyatt with a cadre of future patrons for his gambling parlors! The upper floors, consisting of 33 rooms, were rented out as lodging quarters and offices. Early tenants included J.H. Grovesteen, a bookseller and county clerk, a jeweler, an optical needs store and real estate offices. After the turn of the century, the upstairs rooms were rented out by a lady who billed herself as a fortune teller, but soon re-invented herself as Madam Cora. Madam Cora was a marketing genius. While San Diego’s other infamous madam, Ida Bailey, specialized in quality, Madam Cora specialized in quantity. Knowing that many foreign sailors arrived at Horton’s wharf at the foot of Fifth Avenue, and that they may not speak English, Madam Cora devised a method to ensure that their needs could be met. She dressed her girls in dresses of different solid-colored hues and strolled them up and down Fifth Avenue. If a gentleman saw a lady that struck his fancy, he tapped Madam Cora on the shoulder, pointed out the object of his desire, and she handed him a marble of the same color as the lady’s dress. That evening, he would present himself at Madam Cora’s Golden Poppy Hotel on the upper floors of the Louis Bank of Commerce Building, show her the marble, and she would direct him to the door of the same color. Behind that door would be the lady whose dress corresponded with the marble. Not a word had to be spoken! After their business was concluded, the gentleman could leave by the back stairs and drop the tell-tale marble down the outhouse. This was most useful if the patron was an elegant gentleman from Banker’s Hill or some such neighborhood, who absolutely did not want to return home with the offending marble! Further into the 20th century, the building housed Ratner’s Electric, which earned it the nickname, “House of 1,000 Lights.” Tenants additionally included offices and restaurants. In November of 2016, the fully restored stately structure was purchased by PREF Commerce, an affiliate of local Paragon Real Estate, for $7.1 million. The 22,000 square feet of this Gaslamp jewel are still being redeveloped. —Sandee Wilhoit is the historian for the Gaslamp Quarter Historical Foundation. She can be reached at swilhoit@gaslampfoundation.org.